West Virginia lost treasure sites are listed on this page. However, I cannot promise that this information is completely accurate. As treasure tales go, because they have been passed down through many years, certain elements of the lost treasure story may have been altered, either intentionally or otherwise. 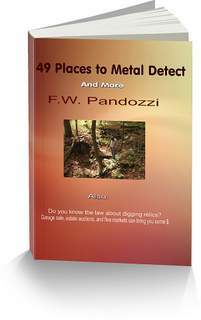 In addition, if you own a metal detector and you plan on searching for lost treasure pay attention to the Federal law that has to do with digging artifacts on any State or Federal lands. Visit this page for more information. When you are metal detecting in city, town or village parks be sure there are no laws that restrict you from doing so. Good luck! And have fun in your search for West Virginia lost treasure. Located on route 64. In 1763 a well to do farmer buried a large treasure of gold and silver coins in a burying ground in Charleston. The farmer could not return to his treasure because he was killed by the Indians during Pontiac's War. Somewhere on route 62, east of Point Pleasant, is this mine. Indians killed the mine workers who were storing large amounts of silver ore and bullion inside the mine. On the south bank of the Ohio River, near Paden City, is the remains of a river boat steamer. At times, after flooding silver dollars can be seen on the shore. Located on the Ohio River. Relics and old bottles, treasures in themselves are often found on the banks of the river near Raven Rock. The artifacts may be coming from another steamer wreck. The Carpenter farm was located approximately one half mile from Bear Fork Creek. In the 1930's, $2000 in gold and silver coins were buried on the farm. Not to far north of Kermit on route 52, on the east bank of the Tug Fort River, is a buried treasure of approximately $200,000 in gold coins. Dennis Atkins supposedly buried the cache near the toll bridge in the 1900's. West Virginia lost treasure may be located in ghost towns. My Special Bundle Package of eBooks!